Our master bedroom is about to go through a big makeover and I want to make the wall behind the bed extra special. 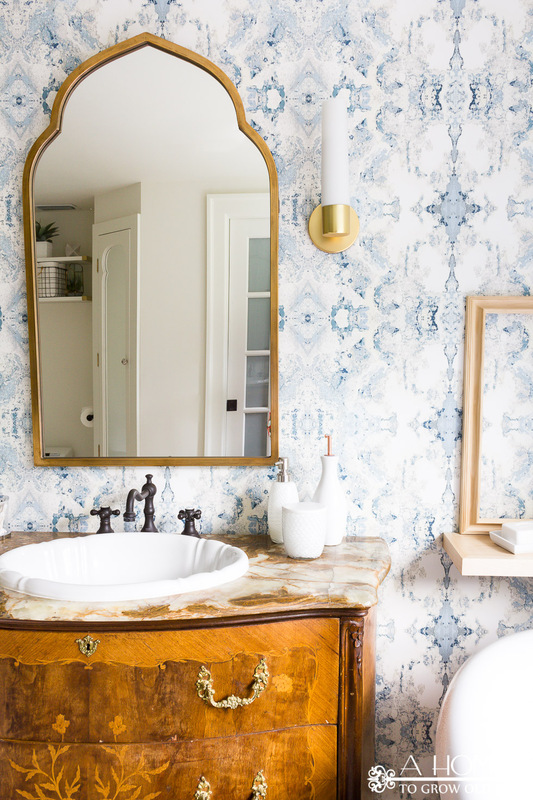 Using wallpaper for accent walls is regaining popularity once again after nearly a 20 year hiatus. The bedroom will have a blue and white color scheme and will be more casual with a relaxed coastal vibe, which is much different than our current colonial and traditional bedroom. 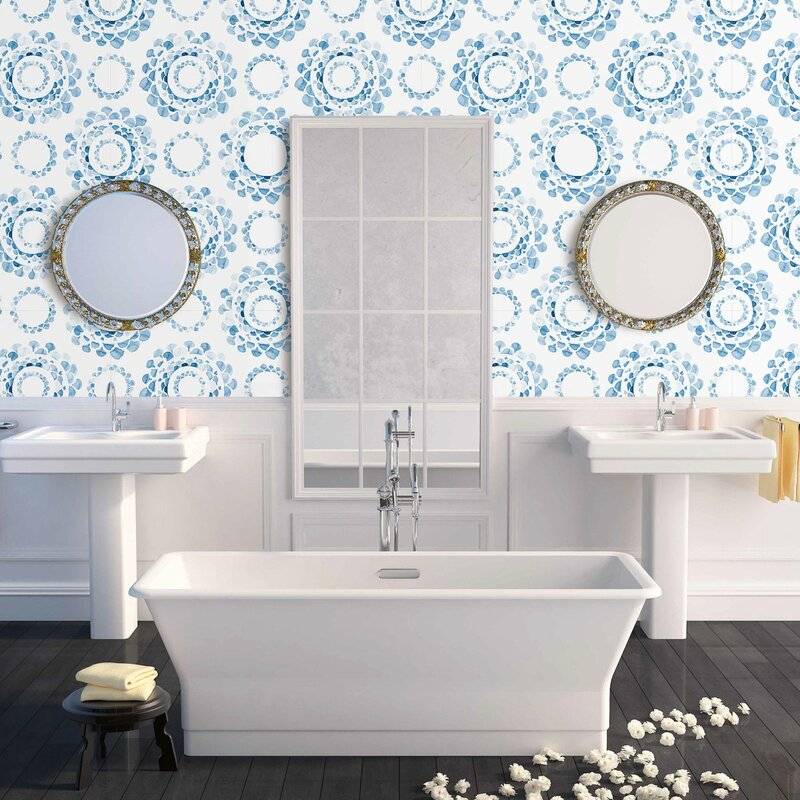 To help my inspiration, I’ve gathered some beautiful blue and white wallpaper patterns that have caught my eye recently and I would love for you all to help me choose one! Affiliate links are provided in all the titles to where to purchase the wallpaper if you are interested in any of them also. 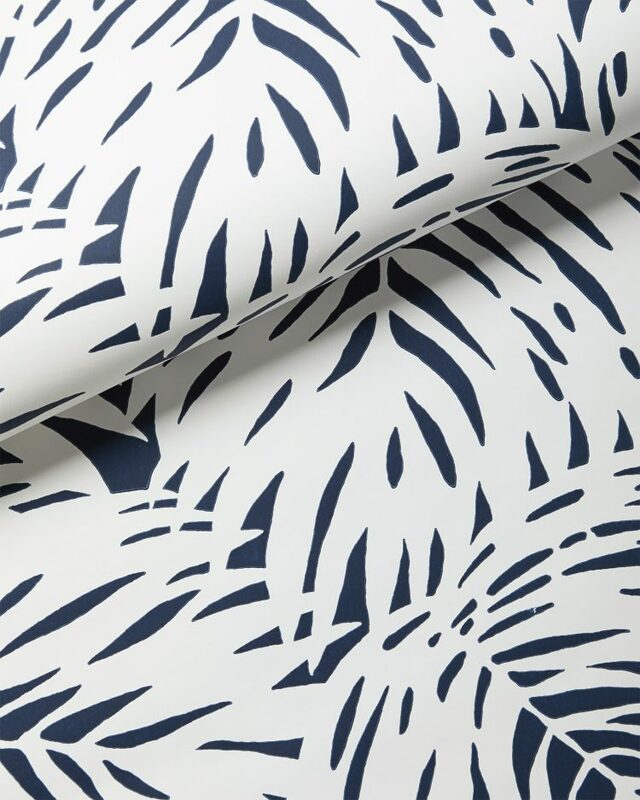 This navy palm print is bold and graphic and expresses a fun tropical, beach house escape vibe. Priano is a top contended and is very popular right now. I like the feminine and flowing wispy branches. 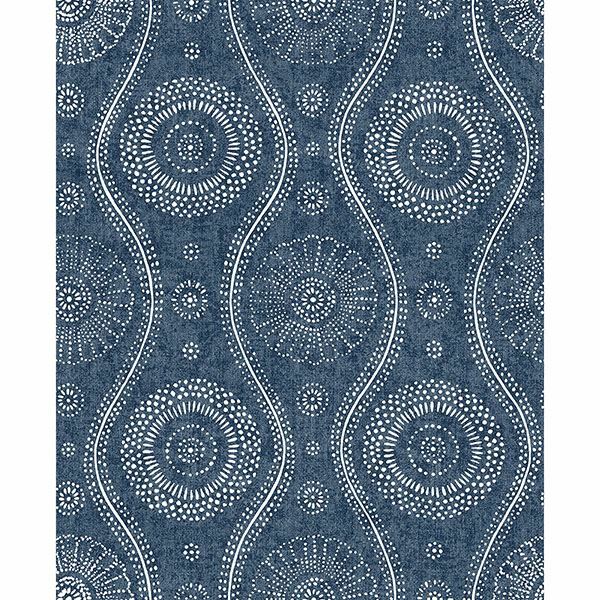 The pattern is comprised of navy and denim blue watercolor. 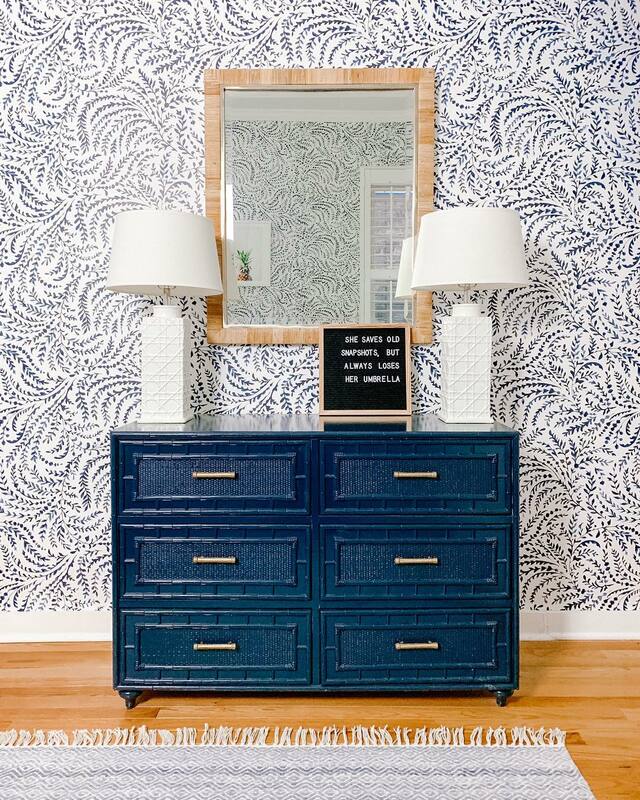 I’m also crushing on that gorgeous cane dresser! Inner Beauty by Anthropologie is simply stunning! 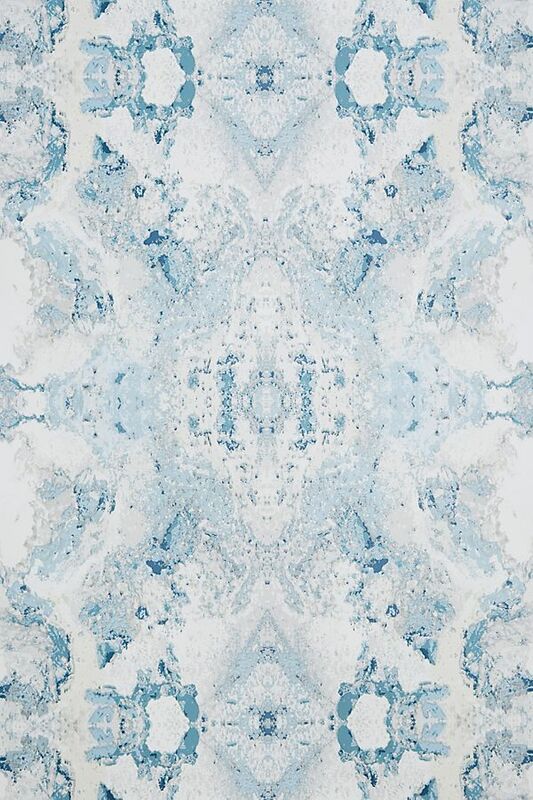 Again, the soft watercolor brushstrokes and pattern in muted blues and cream create a romantic and vintage appearance. It reminds me of our living room rug too. Anything Serena & Lily does is just gorgeous in my opinion. This simple medallion stripe is subtle in the white and yet can be very bold in the navy color too. 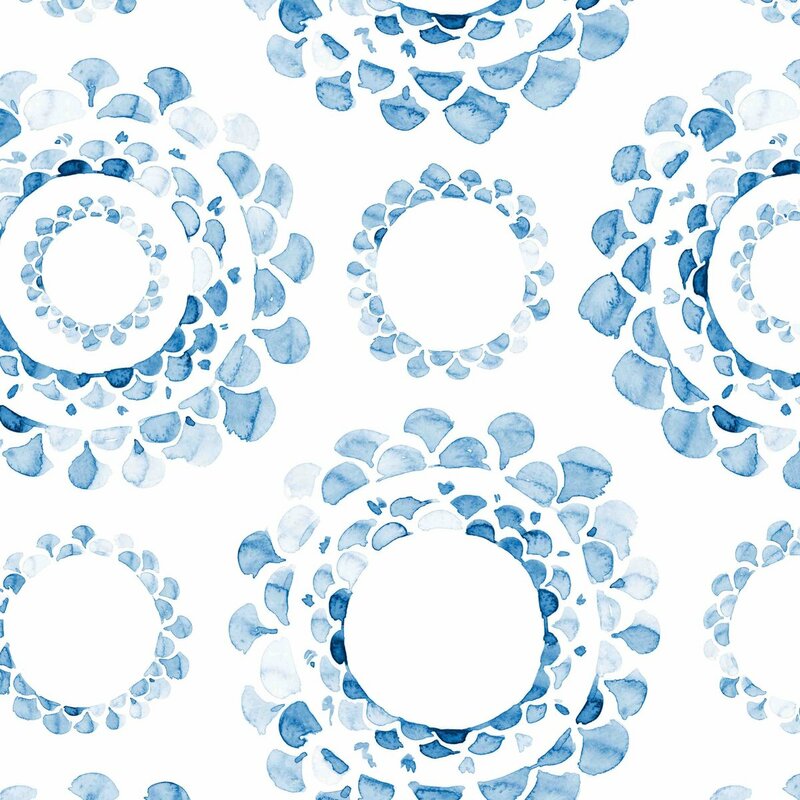 These pretty water color medallions remind me of flowers, don’t you agree? I like the variation of light and dark blue tones. The best part about this wallpaper is that it is peel and stick! I have a fondness for medallion prints too! This one by Sarah Richardson, one of my favorite designers, is really growing on me. It has a vintage linen print background with white highlights on navy. So which one do you love and which one do you think I should choose for our master bedroom accent wall? Give me your opinions! Navy seagrass sounds amazing! I would love seagrass too but I’m not sure I could afford to have it installed! I’m planning on installing all of this myself, though it’s been years since I last installed any wallpaper. Am immediately struck by the Navy Palm-clear blue, good size pattern, good proportion color and white, and just enough coastal. Enjoy whichever you choose! It’s beautifully bold and striking isn’t it? Thanks for giving me your input Penny! I appreciate it! 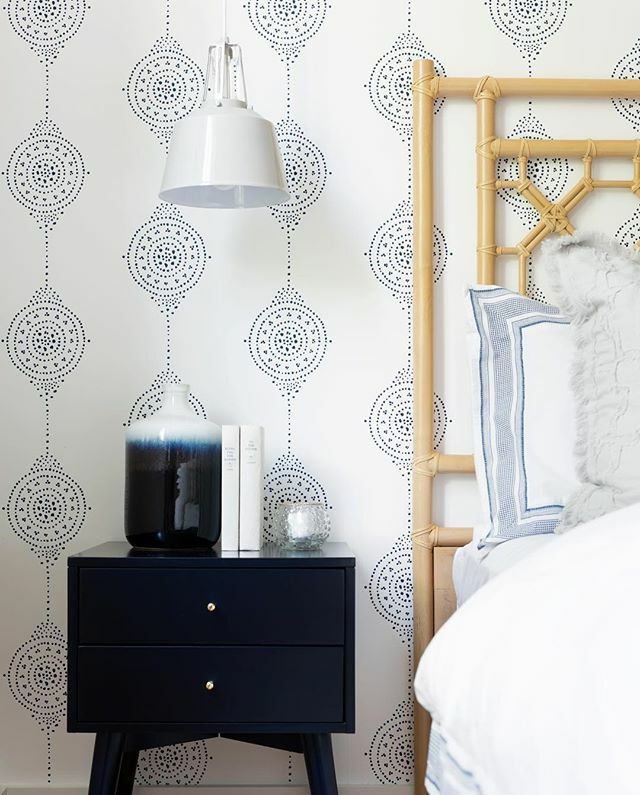 The Painterly Indigo Wallpaper by Sarah Richardson is my choice. This may sound strange, but it gives color and pattern while remaining calm. The others, while beautiful, are too busy for a bedroom. I think the wallpaper should give you that pop and still be restive. Imagining them in our bedroom makes me anxious. Bottom line, what feels right to you? I love the muted look of Inner Beauty. I would not tire of the softness of the look and it feels more textural. But they’re all really pretty! Inner Beauty is so calming for sure! You have a great sense of style Linda! Thanks for weighing in! I think I would pick the palm or inner beauty. Not really a blue person more turquoise like the ocean. I would love the palm also in green. Felicity is my favorite. Gorgeous! I am going the blue and white route as well. So classic and calming. Painterly and Luna stripe are my finalists assuming it’s a fair sized wall. 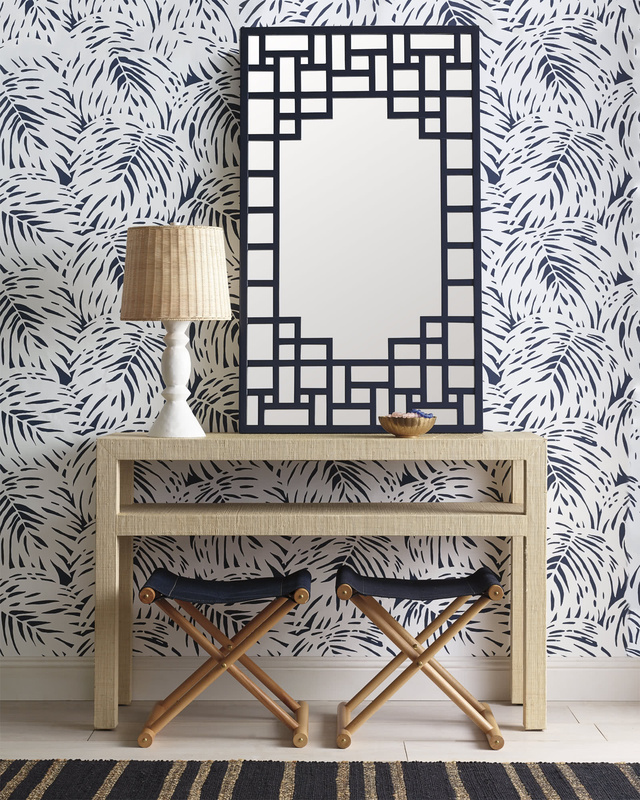 I’d go with a bolder print if the wall was small. I think either of these two are something that you could live with for a long time. I like the navy palm. 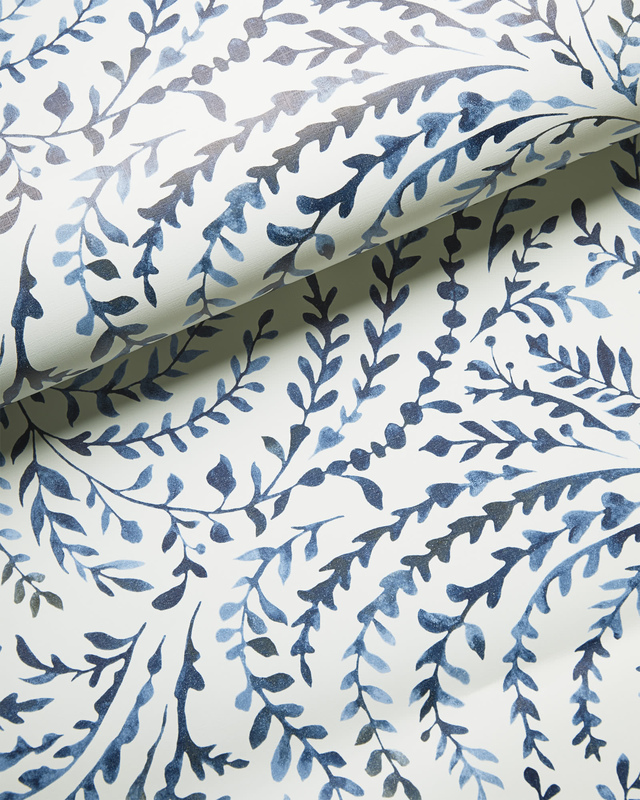 I love Navy Palm but it’s too bold for a bedroom – it would be stunning in a half bath. 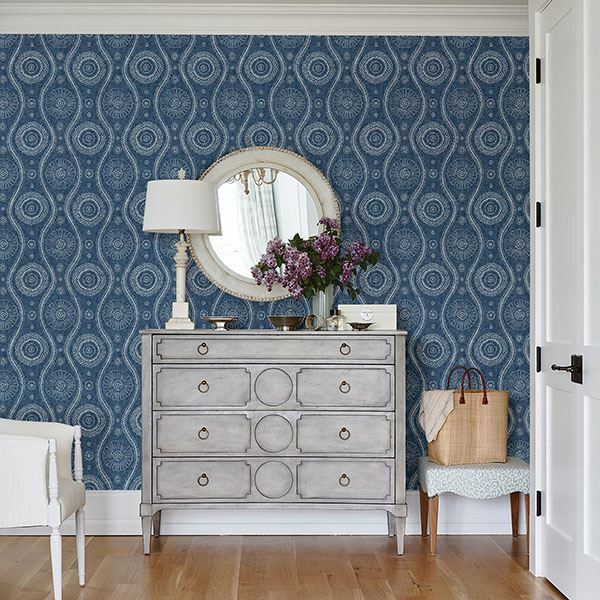 I’m in love with Inner Beauty Wallpaper by Anthropologie – you can just fall into its soft curves. Very relaxing for a bedroom. The Inner Beauty is very relaxing for sure! Thanks for weighing in! The Sarah Richardson one! Love it! And it’s not too busy for the bedroom. Thanks Julie! I think so too! The navy palm design is striking, but, as passionately as this northerner loves palms, it would keep me awake. Likewise the busy Priano print. I like Anthropologie’s Inner Beauty. The shades blend softly and eschew aquamarine and turquoise. The pattern and blending reminds me of the Shroud of Turin’s image which could not be seen until it appeared in a photograph’s negative. Anthropologie’s designs have inspired my own living room, albeit constrained by a budget. Painterly Indigo is the one I like. It’s restful. I could sleep peacefully in that room. 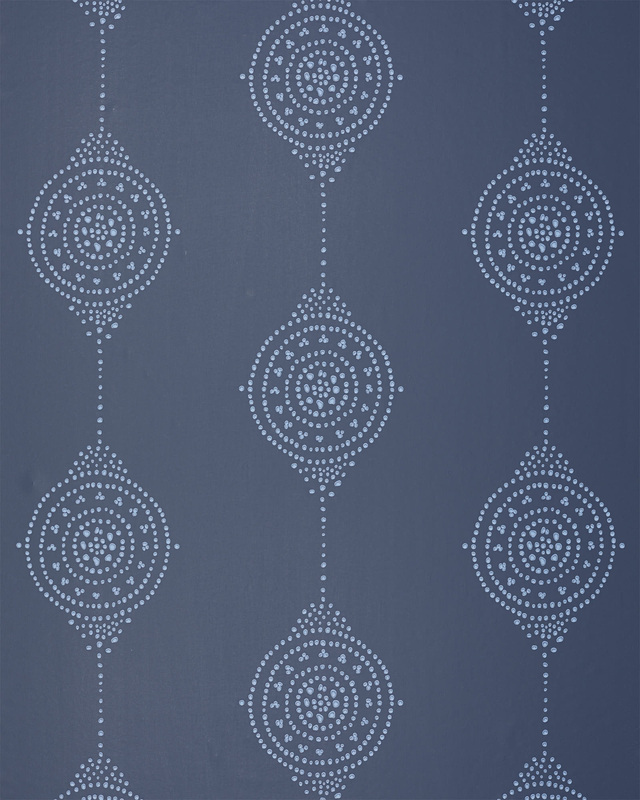 And the pattern’s verticalness can accentuate the height of your bedroom’s walls. 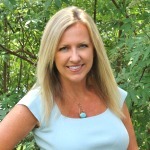 Thank you, Kim, for sharing such creative ideas and how-tos. I’ve looked forward to your Sand and Sisal ever since I discovered it in October 2015 and have saved almost every one. Enjoy every moment of your bedroom makeover! Your insight to each design is very thoughtful and spot on! I too thought about the shroud when I saw it! Thank you so much for following along with the blog and your very kind comments! I seriously appreciate it!